Mark, that particular sword really speaks to me. Can anyone give any more information about it? It's a striking piece! A comparable physical example from the River Saone, in very poor condition, is held by the Musée Vivant Denon. 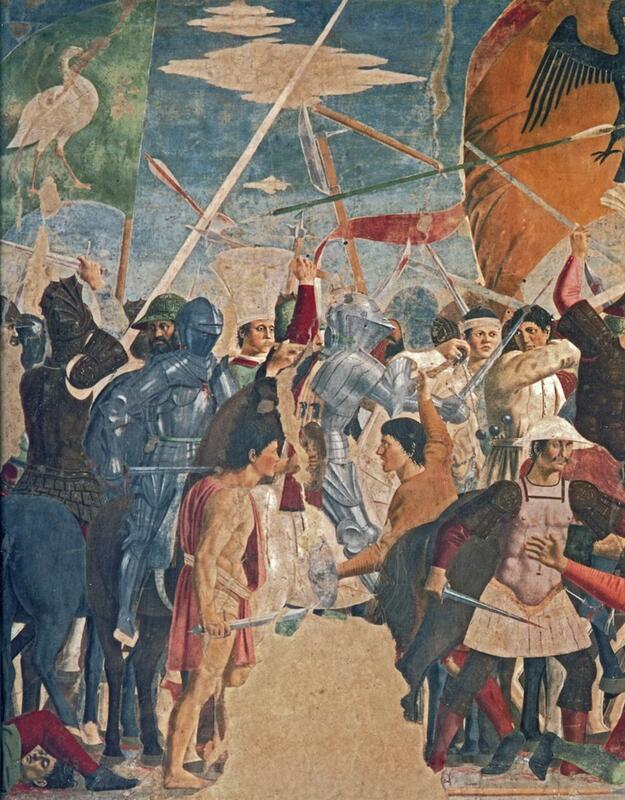 I have also identified examples of this type hilt with the finger+knuckle guard in two paintings by Piero della Francesca, dating from around the 1460s, both combined with falchion-like blades. The sword held by the shirtless fellow in the foreground is exactly similar; easier to see in the zoomable image at the link. A similar pommel can be seen on a late 15th altarpiece, combined with a distinctly Spanish style hilt. Cat. No. 63: This one is actually unknown to me, save for the description in the catalogue and some additional details that Sir Richard gave me back in 2006 when he invited me to see him. I have not seen a photo, unfortunately. The inscription is dated 770 AH / 1368-69 AD and was a bequest of the Sultan al-Ashraf Sha'ban. There are actually very few swords with this inscription in private hands (although it is very well-represented in Istanbul's Military Museum) so it shouldn't be too difficult to match to the description if something similar comes up in the future. The other two swords that were previously owned by Hyde Parker were of course the Type XIIIb in Roger's photo with the pear-shaped pommel, above, and another ('classic') XIIIb with a circular latten pommel and an inscription dated 1367-68 in the name of the emir Ukuz. This latter sword is now in the Furusiyya Art Foundation (Acc. No. R-244). Great, thanks! I've been collecting documentation on the Alexandrian swords for my own interest... I knew about the Furusiyya sword, and thought it might possibly be #63 from "Art of the Armour", as the latter is described as having the latten disc pommel and marked with concentric circles and a "reversed 'P'" - matching the former. I did not have the information about the differing dates and donors. I'll withhold judgement on this one for the moment, as I know its current whereabouts and will try to have a closer look at it sometime soon. Fair enough, I hope you can share your conclusions when you know more! Another sword attributed to Boabdil, in Paris, has a similar Moorish hilt paired with an XIIIb(?) blade bearing a 'wolf' mark, again suggesting a non-Moorish, European product. There are a few examples of the pear-shaped type of pommel in 14th century art, including at least two of nearly similar form on tomb slabs in the Armenian Church in Nicosia, Cyprus (dated 1356 and 1385). The best representations, however, are those on the incised effigial slabs of Sir Lambieres d'Abée in Liège, Belgium (1312), and of Guillaume Tirel at Yvelines, near Paris (1363). Here might be another example, from an Italian painting in the Met, circa 1340s. It appears to have a grove in the pommel, but when you zoom in you see it is actually a crack in the canvas! I have found some additional, less ambiguous examples of the "Alexandrian pear" pommel in Italian altarpieces...St. Paul is nearly always depicted with a sword, and he appears frequently in altarpieces from Sienese artists in particular. From the church of San Pellegrino alla Sapienza, by Bartolomeo Bulgarini, circa 1350-70, so contemporary with the first round of Alexandrian bequests. Much older: signed and dated by Meliore, in 1271. Some altarpieces also include what could be depictions of the "Alexandrian wheel" pommels, best known from the type-XIIIb swords like the one first posted in the thread. The pommels are distinguished by small central bosses (compared to classic Oakeshott type-K pommels) and additional circular grooves/decorations. The last example also shows Paul gripping the sword with one finger looped over the cross, implying the presence of at least a minimal ricasso, and demonstrating the technique that led to the introduction of the protective finger-ring seen on some Alexandrian sword (and elsewhere). 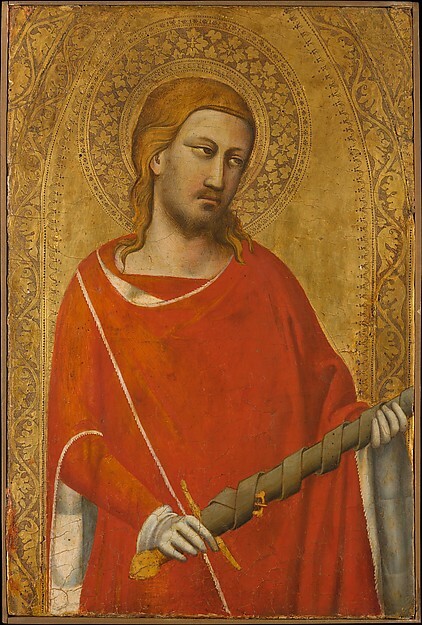 This style of grip appears frequently in 14th century Italian art from at least the 1320s, where it appears in altarpieces by Simone Martini and the Lorenzetti brothers, the leading Sienese artists of the time. That is a really good find as the artist have deliberately shown the hand position in clear detail. Shame we don't have more information on the picture. 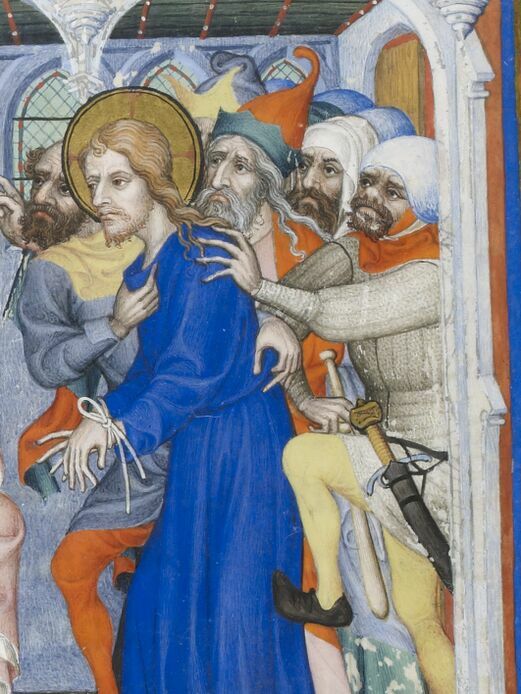 So the finger grip style starts to be shown in Italian art from the 1320's. How long until you see finger rings as dominant in art (in Italy or other places)? So basically is there a long or shot transition period between no ring (with finger position) and finger-ring? Examples of finger-rings seem as rare in art as surviving physical examples... Most examples in art are Italian, much fewer are Spanish, and a couple are French. Finger-rings become more common later in the 15th century and can be found in paintings by many well known artists of the early Renaissance; by this time more complex hilts were developing in Italy and Spain. The finger-ring was definitely introduced much earlier however. The earliest example that I know of is a panel in the Met (at far left). 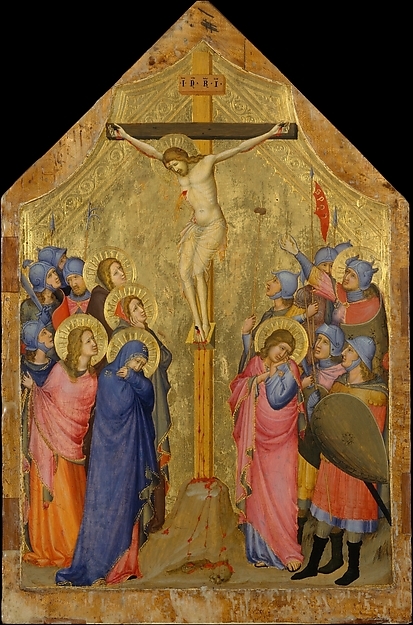 The museum's online description is confusing... they date the painting to 1330-35, but a matching panel from the same altar by the same artist is dated to 1340-45. The latter date is given for both panels in print publications. Note that in this case the ring appears with a single-edged blade (as do the examples in Piero della Francesca's paintings posted earlier). I understand that one of the Alexandrian swords in the Askeri Muze in Istanbul likewise combines the finger-ring with a single-edge. A finger-ring appears in one of the famous Book of Hours commissioned by the Duke of Berry in 1389. This miniature is by the "Master of the Parement", who might be identifiable as Jean d'Orleans - a French court painter ennobled by Charles V.
A double finger-ring appears in another 14th c. French manuscript, paired with a similar type-H1 pommel. 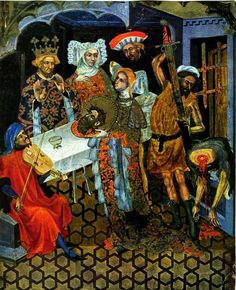 Another double-ring is shown in a painting of the beheading of John the Baptist by Catalan artist Lluis Borrassa (c. 1360-1425). Finger-rings appear throughout the Aragonese Grant Cronica d'Espanya, created between 1377-96. That is interesting that finger rings weren't deemed absolutely necessary for quite some time (over 100 years!). 1) Perhaps because it was the cost (and difficulty?) to add a finger ring on the sword without adding that much extra hand protection (perhaps fighting style still was with very retracted hands, making hand sniping rare occurrences even though you had one exposed finger on the ricasso? 2) When finger rings start to become common in the late 15th century it could reflect a general change in fighting styles were "hand sniping" becomes much more prominent and finger rings now gives you are really important protection? Another previously unlocated Alexandrian XVIIIc has resurfaced at auction! It shares the same maker's mark that appears on the XVIIIc in the Royal Armouries: the letter P surmounted by a cross potent, twice repeated. It looks like this is the sword shown in the lower left in the photo from the Ottoman armoury, distinguished for the maker's mark and the damaged tip of the blade by Clive Thomas in his 2003 article. Just to update everyone, I had a very close look at the sword in Mark's post above when it was in the storeroom at Christie's back in February of this year. 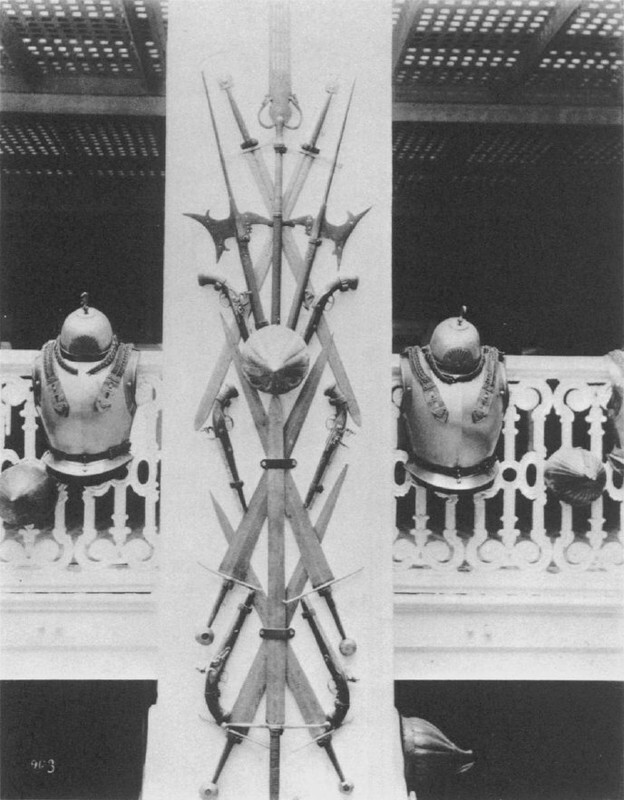 While it is, without any doubts whatsoever, a superb example of this group, it is most definitely not the sword shown on the lower left in the old photo from the 1880s, even though it looks very similar. It wasn't completely unknown either, although my attention was only drawn to it in mid-2017. It appeared at a Graf Klenau auction on 16th June 1973, Lot 5070, and had been in a private collection in Germany until recently. Of course, this still means that the one in the old photograph is still 'out there' somewhere, along with several others that have not yet been fully accounted-for! Thanks for the additional information, Clive! I forgot to say also that the Leeds Castle sword (known by the accession number AL.40.1) is no longer at the Royal Armouries Museum and has presumably been returned to the collection at Leeds Castle, having been on loan to the RA since presumably the 1970s after Lady Olive Baillie, the last owner of Leeds Castle, passed away. I don't want to post a new post on these sword, so I'm just gonna write my question here: what was their original grip like? All those Alexandria type XVIIIc swords have a wooden handle, they seem quite a slim one, were they covered in leather or not? Also carrying the same maker's marks the letter P surmounted by a cross potent, twice repeated. Cross guard 11.7 cm . That's a great question and I'm looking forward to the experts' answers, as I'm considering an Alexandria replica build. The grip does seem slim, almost delicate, on these huge XVIIIc blades. Also, I would add to your question, is there an enlarged hole in the base of the pommel, as if the grip extends a bit into the pommel? In the closeup above it appears so, but that could be just a shadow or some dark residue that escaped cleaning.